The British Gazette » Politics: The pariah of purchasing. Above Top; the Flamanville nuclear plant at Flamanville, Mancheon the Cotentin Peninsula. Above Bottom: An F-35B performing a test landing on USS Wasp (LHD-1). Back in the 1980s your Editor was a member of what was then the Institute of Purchasing and Supply and for a time Chairman of the Yorkshire branch of the same. The institute had many members employed in the public sector and one of the constraints imposed on these purchasing professionals was “politics”. Their political masters – local councillors and nationally, government ministers, would due to politics impose constraints on their decision making capacity. This meant that they were not free to chose the most suitable supplier but alternatively had to go for a supplier that met the requirements imposed by the politicians. This is of course one of the downsides about living in a multi party democracy! Even so, there are times when the bungling of our elected representatives is such that they would test the patience of a saint! Therefore British Gazette readers – very few, present company included, are saints – can be excused perhaps of loosing their temper with these idiots! In yesterday’s article we agreed with Guardian columnist Simon Jenkins about the terrible deal Hinkley C represented and proposed an effective way of providing the generating capacity that is desperately needed now quickly and in a way that is affordable. The situation however is a lot more complex that that. Why? Politics! When the Conservative-Liberal Democrat coalition government took the decision as to what design of nuclear reactor should be they chose the European Pressurised Water Reactor (EPR). There were others, the most promising being the Westinghouse AP1000. However the AP1000 was never in with a chance. The nuclear regulator came up with the reason for rejecting is as “incompatibility between the US Imperial system of measures used in the design and the UK’s use of the metric system! Thus against the backdrop that the Chinese were constructing two such reactors in China (the use the metric system) and that one of the UK manufacturers who will be involved (Rolls Royce) supply aero engines made to metric measurements to US aircraft made to Imperial! The simple FACT is that the EPR was chosen because it is French and thus the deal was all part of the politics of European Union. 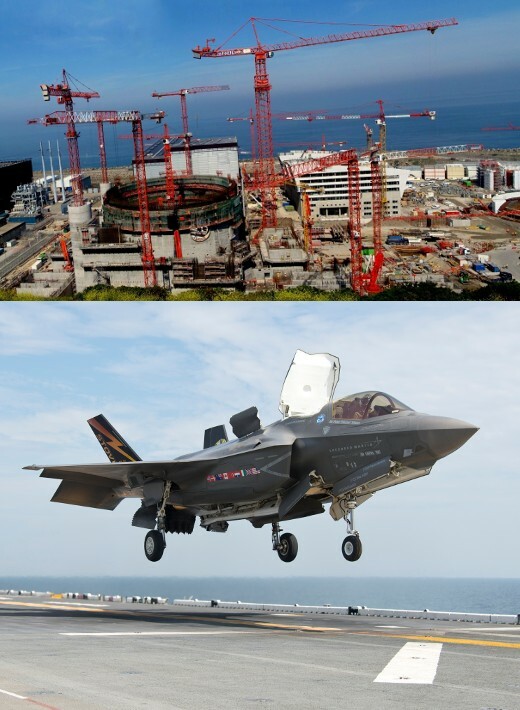 A very very very expensive FACT is that the two EPRs are being constructed – one in France and one in Finland – and both are years behind schedule and billions over budget! And as for the F-35. Well some of our readers have blood pressure problems so out of consideration for their health, we won’t go there! Of course, politics still surround Hinkley Point. It is a stupefyingly BAD DEAL for every human being unfortunate enough to be an electricity consumer in the UK! You Dear Consumer will be paying through the nose for decades for some of the most expensive electricity on the planet! And you WILL be paying it! Because the deal is almost certain to go ahead. Mrs May has put the deal on hold as part of the negotiations going on before Article 50 is submitted. The problem with cancelling Hinkley is of course that it will seriously anger two countries that the UK does not want to anger at this present time! Firstly France. When the negotiations post Article 50 do get under way, the French are going to be angry. Very angry indeed! There is no need to aggravate the situation! As for the Chinese? Well let us put it this way: It is not wise to annoy the leadership of the People’s Republic of China! Some commentators are suggesting that Mrs May may be considering removing the Chinese investors from the picture with her thoughts being: “Since the deal is effectively a licence to print vast quantities of money at the expense of the British electricity user, could not a more deserving set of recipients for this largesse be found? The answer of course us an emphatic yes! However taking away this money tree from the Chinese is going to seriously annoy the Chinese Communists! A suggestion to Mrs May: If she were to decide to use public money so the taxpayer would gain the largesse, maybe she could ask Comrade Corbyn to call upon his fellow communists and explain things! But there again, maybe not as there is a danger that poor Comrade Corbyn’s return to these shores might be delayed. Indefinitely! And that would mean someone who is electable as Labour leader would fill his shoes! Of course, considering the dire situation we find ourselves in some British Gazette readers may ask this question: “Is there, or was there a way of making nuclear generated electricity affordable and cost competitive. Well the answer is yes. But politics made it impossible. You see, the development of civil nuclear power sprang from and has always been intricately connected with nuclear weapons. This FACT dictated the way the technology was developed. Another FACT has been perceived national interests. Each country had to have it’s own programme. Of course, the link with the military dictated this. There is a way of generating nuclear electricity but it cannot be part of a nuclear weapons programme. Furthermore, to make it competitive it has to be on a very large scale. This is because with civil nuclear power economies of scale are essential to get the costs down. If the western nations had made a multi-national agreement vis-à-vis civil nuclear power affordable nuclear electricity would have been possible. The technology was developed by Canada. The Canadians call it the CANDU reactor. It is a type known as NUHWR (Natural Uranium Heavy Water Reactor). The fuel is natural uranium and not the enriched variety but this requires the use of high concentration heavy water as both a moderator and a coolant. Whilst the costs of constructing the NUHWR reactor can be kept lower than other types and the cost of using natural uranium are lower than using enriched uranium, the costs of using heavy water raise generating costs substantially. The way to overcome the high costs of heavy water would be to have an international agreement whereby countries with significant hydro electric and tidal resources would generate large quantities of heavy water and therefore would sell such to those countries building a NUHWR reactor to a standard design. We do know that multi national projects do work – the Panavia Tornado being a good example. What to do with the nuclear waste? Well what you do not do is reprocess it! Reprocessing is expensive and contributes to the volume of waste. In one of his best decisions of his presidency, President Jimmy Carter ended reprocessing in the USA. The problem is where to place the nuclear waste? The British Gazette would suggest that there is an obvious answer: Antarctica. The solution should be to transfer the sovereignty of Antarctica from it’s claimants (including the UK) to the United Nations. Waste could be stored at sites a long way from the Southern Ocean and rent could be paid by the depositor to the UN.